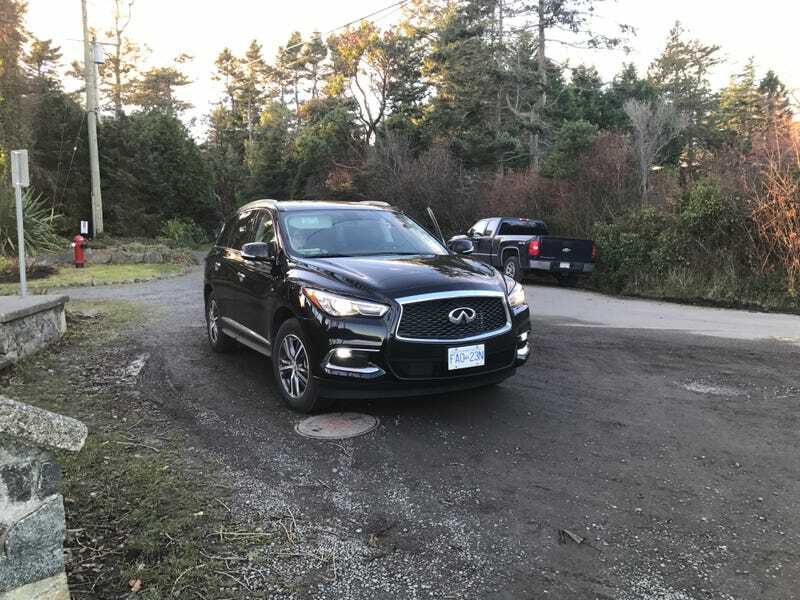 Infiniti QX60 looking north on Vancouver Island, CA toward Washington State, USA. My wife and I went to British Columbia, Canada for a week to visit family, snowboard, and visit Vancouver Island. We picked up an Infiniti from National, which was a handsome vehicle in black. Driving to Whistler takes about an hour and half. The scenery is beautiful and the roads are winding. The 3.5 liter V6 offered ample power for lane changes when passing lanes opened up and for climbing the hills as we drove. In fact, it was helpful for a particularly quick trip from Victoria to the ferry port on Vancouver Island when we realized there was only 1 ferry left for the day. Sitting tall, the ride was smooth, quiet, and commanding. The Infiniti felt like a boat, yawing across the sweeping curves, which makes sense because few SUVs overcome their basic design flaw of being essentially a sedan on stilts. No one will mistake the QX60 for a sports car like say the Porsche Macan. Personally, I like the design of Infiniti and Mazda the most among Japanese manufacturers. Compared to the awkward exteriors of Lexus or Acura, Infiniti’s lineup looks simple and classy. In black the QX60 offers a dignified presence on the road and looks sleek. I like the D pillar’s styling with a small crescent cut that makes the roof line look like an American wagon from the 1950s. The interior was simple with black leather seats, some soft touch plastic, and had a basic infotainment system. Our toddler road in the middle row. I noticed a folding third row was available, but almost no luggage space would exist if the seat were opened. With the seat down, however, there was ample space for a stroller, luggage, and our bags. In sum, the QX60 was a willing partner for a family winter vacation. Personally, I would have preferred an Audi Allroad or a Volvo V90 for such a trip, but choices are rental car companies are often extremely limited. The Infiniti did a great job safely hauling my family through the beautiful landscape. At Butchart Gardens on Vancouver Island.